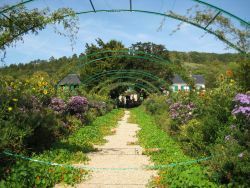 I had to do a bit of stretching this month with the alliterative travel I've been doing lately, like M is for March and Morocco and A is for April and Amsterdam, so work with me on M is for May and norMandy. At least N follows M, and I'd hate to think I'd never get to go there because there isn't a month with the letter "N" in it. 5 of us loaded into a Renault rental car and took off from Paris Thursday morning and headed north. First stop was Rouen, and their amazing cathedral that took nearly 400 years to build. The spire is the tallest in France and is the same height as the hills in the area. 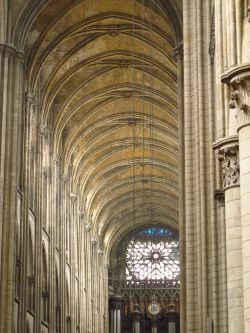 It spans the entire French Gothic area and its nave and arches are good representatives of the architecture. Monet was such a fan of the Cathedral that he painted it 30 times over the span of 2 years in all different lights and times of year. We had lunch at an adorable tea room with views of the Cathedral called Dame Cakes. 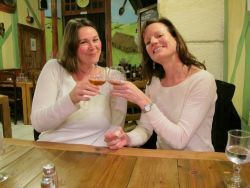 I had a lovely egg and fig tarte and we starting our cider tasting since we were heading into apple territory. It is a tea room, but they also had a large selection of hot chocolates, which we couldn't resist. We wandered through the charming small town with half timbered houses and a beautiful clock that had two identical hands with one giving the hour, and the other, showing the moon's cycles. 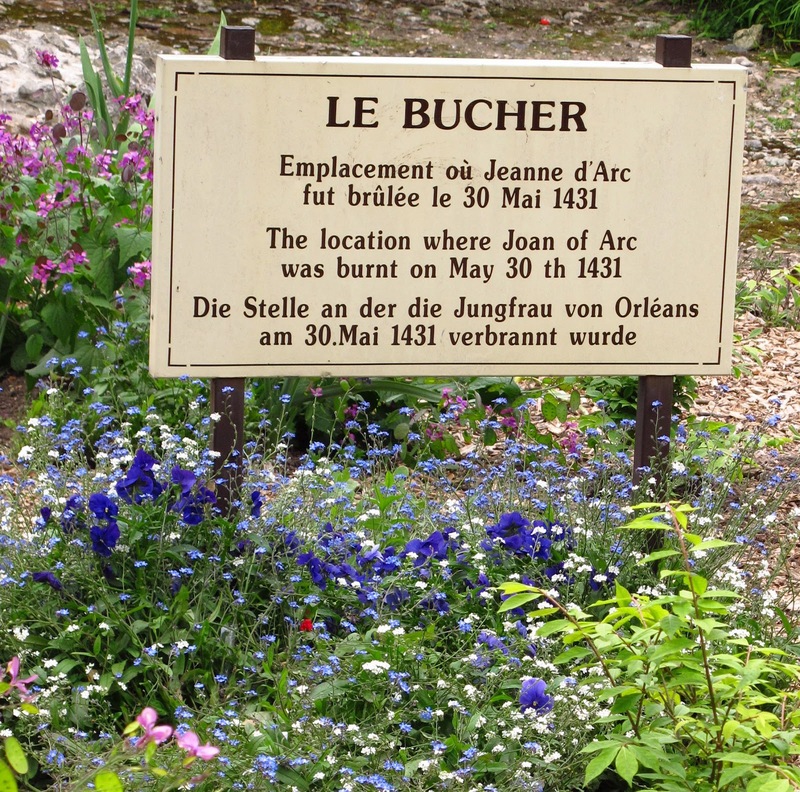 Joan of Arc also met her maker here on the Place du Vieux Marche. A simple cross marks the spot and a very modern looking church was constructed just behind. We then continued north and drove through the lovely coastal towns of Deauville and Trouville-sur-Mer where the wealthy go to gamble, watch the horse races, and sunbathe. We stayed just east of here on the Cote Fleurie in Honfleur. 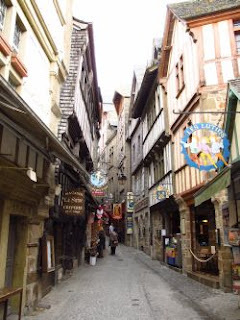 Honfleur is a working port with a cute marina of bright colored awnings covering wall to wall cafes that were all a bit touristy, but one street behind and you could see more of the charm in the cobblestone streets and more half timbered houses. We had a nice meal at Au Bouillon Norman of escargot in a puff pastry, a juicy steak and an unbelievable dessert with homemade caramel ice cream and creamy sauce. 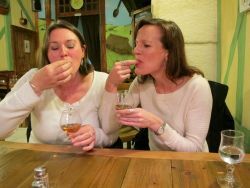 Our research on Calvados began this night as well. 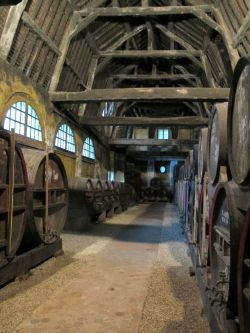 Normandy is home to this famous cider brandy with alcohol content as high as 42%, but more on that later in the education process. We tested a few different ages and liked the older ones, which of course are more expensive since they spend more time in the barrel. The apple rounds out the flavor a bit more than a regular brandy, but it's still equally powerful. We were ready for bed after this. We were up early the next morning to make the hour + drive to Bayeux to meet our guide with Overlord Tours for our visit to the D-Day beaches and cemeteries. It was hard not to say "Ovvvverlord" with a deep, menacing voice every time we got in and out of the van, but I did my best to keep it serious for this important tour. It was a very good, informative tour, and I should confess "refresher" on the events surrounding WWII in this area. There's too much to recount, but here are a few highlights. I was amazed at how battles were won and strategy set and executed given the limited resources and technology. These shot at a range of 15 miles, but never hit anything. They were set back from the cliffs and when all of the communication sources had been blown up, messages were exchanged by someone holding up a handwritten board. Not really a wonder they never hit anything. We toured the Omaha Beach and saw a few remaining bunkers still in tact. The American cemetery was oddly peaceful, set a top a cliff and filled with over 9,000 graves. The green grass contrasted with the all white grave markers and the ocean behind. The German cemetery was a stark contrast with the dark head stones and a much more sober atmosphere. Some soldiers were placed 2, and sometimes 4 in a grave. We also visited La Point du Hoc, which was set on a steep cliff and proved to be a great challenge for the soldiers to ascend. Primitive sling shot mechanisms were built to try and propel people up, but Road Runner can tell you that doesn't work. The bad@ss US Rangers took sharp objects and climbed their way up the side with their bare hands and ropes. This area was completely blown out and as you can see below. Huge chunks of stone were demolished from the bunkers and flung in the air and onto the ground, where they remain today. We went to Saint Mere Eglise where you can see a bronzed paratrooper replica hanging from the side of the church with his parachute. This happened to poor US trooper John Steele, but he is now commemorated forever in this square. Appropriately, the Airborne Museum is also in this town, honoring the American paratroopers dropped behind Utah Beach. The first display reminded me of the Hollywood wax museum sans Brad Pitt, but the rest was good - informative movie and interesting artifacts. Our last major stop was Utah beach, which is at the western end of the attacks, and is where 13,000 US paratroopers were dropped to join the battle. It was a good tour and recap of all the events that took place in Normandy during WWII. We ended in Bayeux, home to one of the longest tapestries, measuring 280' long, telling the tale of William the Conqueror. A helpful audio guide takes you frame by frame through the story of the Norman Conquest of England in 1066. 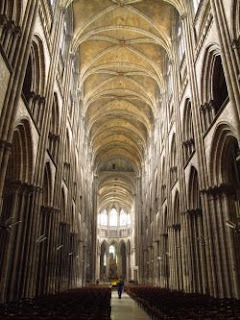 Bayeux is also home to yet another beautiful Cathedral Notre Dame, consecrated in 1077 with William the Conqueror. 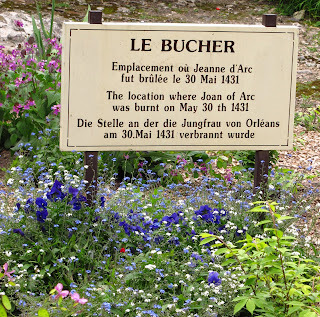 We drove about another hour to the town of Avranches, which would be close to our next day's stop of Mt. St. Michel. 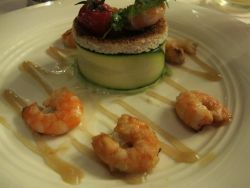 We had a delightful meal at Hotel Croix d'Or, served by an Englishmen who couldn't have been nicer. 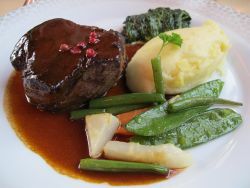 It was a rustic French restaurant that was filled with French people. 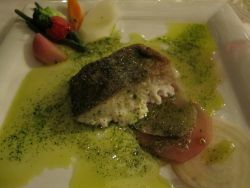 I had a nice pea puree with shrimp, along with cod in a light, aioli. 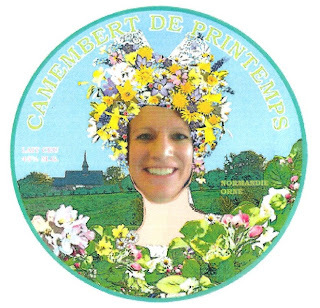 The piece de resistance was the cheese course where we were able to "sample" as much of the local cheese as we desired like Camembert, Livarot, Pont l'Eveque and Neufchatel. We all know of my cheese desires, so I went to bed very satisfied. 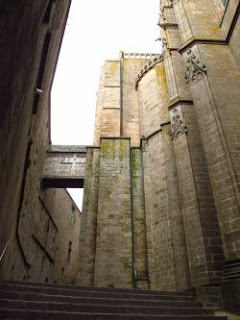 The next day we were up early to try and beat the crowds to one of France's most popular destinations (just behind the Eiffel Tower and the Louvre), Mont St. Michel. This mass of granite is a marvel for many reasons. It's a 264' mound of rock that can look like an island during high tide. It has the highest tides in Continental Europe with a huge difference of 49' between low and high tide. The sea can go out as much as 9 miles before coming back in. There's a church on top that was completed in 1144 and then added onto as Mt. St. Michel became a site for pilgrims starting during the Hundred Years' War. It went back and forth from England to France so it's part fortress, part shrine, and the abbey was even a prison during the French Revolution. It's a windy, narrow walkway to the abbey, filled with many touristy shops, but you're rewarded with great views at the top. The Abbey has been well restored on the inside and includes beautiful cloisters for the monks. We left Mt. St. Michel before the enormous hordes of people arrived and then we began our tour of the Pays d'Auge, which is the farmland of Normandy. Seeing as I was with 3 girls who were living or have lived on working farms with every animal I've ever eaten, I was in good hands. We then visited the Chateau-Musee de Saint Germain de Livet, which had a nice moat surrounding the timbered frame manor. In addition to the swans, they also had quite a few peacocks wandering the grounds. We then stumbled upon a beautiful Cathedral in the distance, the Basilica St. Therese. It reminded me of Sacre Coeur how its domed roof sat high atop a hill. This was one of the newest churches we saw, with construction starting in 1929. The tile work and bright colors made the church really unique and beautiful. We checked into the Hotel Esperance in Lisieux and headed out in the rain for dinner. 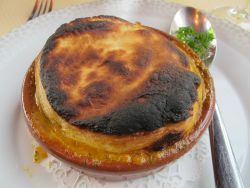 I had heard of one recommended restaurant in this town so off we went to Au Vieux Normand. It was a small, locals spot with a wonderful French woman running the place. Some food was better than others, but it was the French woman who won our hearts. 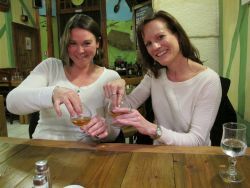 She didn't speak English, but luckily my food French is improving so we did ok, and were even able to continue our Calvados education. I was asking questions about the apply brandy and she would go to google translate with answers and information for us. 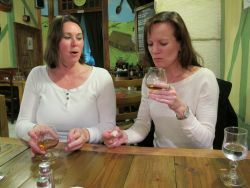 She also told us that a traditional way to drink it is by soaking a sugar cube in the drink, taking a bite and then a drink. Here's a play-by-play of Stephanie and I giving it a try. The sugar definitely cut the ahhhhhhh, burn factor, but the warmth can also be quite nice. 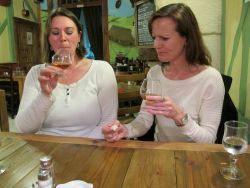 By the end of the night, the woman had written down a Calvados distillery for us to visit in the morning. Seems like a good way to start a Sunday morning to me. After breakfast, we drove to the nearby Chateau de Breuil. Unfortunately it was pouring rain while we were there so we weren't able to linger on the manicured grounds. We did visit the press where the magic happens. Apple juice is gathered from their 22,000 apple trees and warmed, it's vapors transfer across to the final tank where its cooled. Distillation occurs twice to remove some of the harshness and reduce the alcohol level. To make one liter of alcohol, you need to start with 20 liters of apple cider. 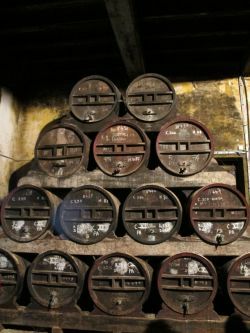 We toured their barrel room and learned the similarities with wine and aging. The liquid goes into new barrels before being stored in older ones for their recommended ageing time. The oak gives it it's color and flavor. The 15 and 20 year Calvados needs to taste the exact same each year so more work goes into the blending, and hence a larger price tag as well. 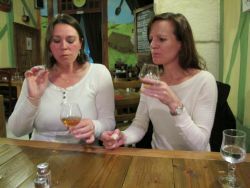 We got to taste a few different kinds, including a Pommeau which blends 2/3 apple cider with 1/3 Calvados for a sweeter, lighter aperitif. 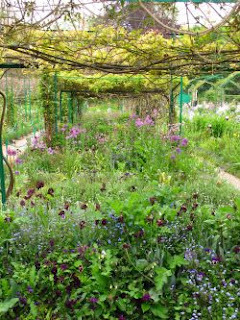 We did more country driving through the farms and half timbered houses of Normandy before arriving at our final stop of Giverny. 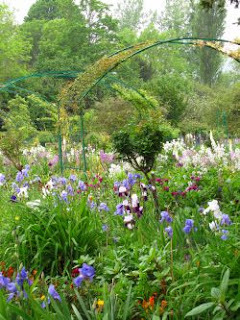 I had visited in the fall last year, but with Spring came many new flowers and colors - even despite the continuous rain. The lily pond was still beautiful, even with the addition of rain and umbrellas. 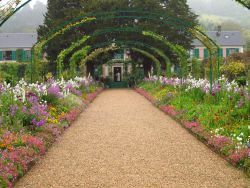 It was a wonderful week-end in NorMandy, and next up for the month of May is My dad's visit tomorrow!